The gene for longhair in cats is recessive i.e. a needs 2 copies of the gene in order to have longhair. 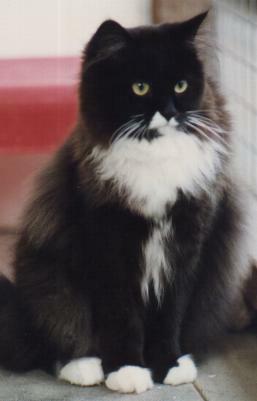 A cat with one copy of the gene is shorthaired, but can pass the longhaired trait on to its offspring - the carried gene will only come to light if the cat is bred to another carrier of the gene or to a longhaired cat. Although this article refers to “a” longhair gene, DNA analysis has found that there are 4 longhair mutations that have occurred in cats at different times. Remains of early cats can't tell us about fur length, but cats depicted in early Egyptian art are shorthairs and the parent species of the modern domestic cat, the African Wild Cat, is shorthaired. The shorthair coat ranges from plush and dense as in British Shorthairs and sleek and close-lying as in the Oriental breeds, with a variety of intermediate coat types depending on actual fur length and whether or not there is a woolly undercoat. There are a number of theories as to how the longhaired domestic cat arose. 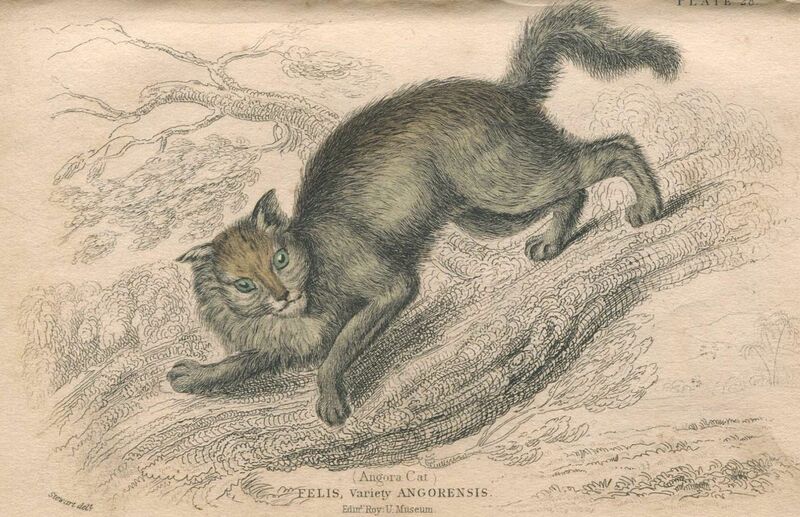 In the 1800s, Pallas suggested that Angora and Persian cats were descended not from Felis silvestris but from Pallas’s cat (Felis manul) which he discovered and named. This suggestion was quoted by Darwin in 1868 who wrote, "The large Angora or Persian cat is the most distinct in structure and habits of all the domestic breeds; and is believed by Pallas, but on no distinct evidence, to be descended from the Felis manul of middle Asia.". There is anecdotal evidence that Pallas cats can interbreed with domestic cats to produce offspring, but to introduce the gene, the hybrid offspring would have to be fertile and be bred back to domestic cats. In 1907, Pocock described the various English domestic cats for Royal Zoological Society and strongly refuted the Pallas cat theory since the skull of Pallas’s cat differed from that of the Angora or Persian of Pocock's time. Modern genetic studies have also shown that the Pallas cat did not contriubte to the gener pool of the modern domestic cat. There are claims that the Persian is descended from the Sand cat (F margarita) based on that fact that both have long hair covering the paws which forms a pad over the soles. Measurements of the length of the hair on the body and feet of both Persians and Sand cats does not uphold this claim. In addition, the long hair on the feet of modern Persians is due to their long coat; in the Sand cat it is a feature since the cats are otherwise shorthaired. Again, there is no genetic evidence of Sand Cats contributing to the domestic cat gene pool (although hybrids have been bred more recently. Single Origin or Multiple Mutations? A more plausible explanation is a gene mutation in a group of cats with the foreign conformation. Inbreeding would have allowed the trait to become fixed. This mutation may have originated in Asia Minor and in a book published in 1876, long-haired cats were referred to as Asiatic cats. From historical writings, the longhair mutation either arose in three separate areas (Russia, Persia (Iran) and Turkey), or that the longhair mutation originally occurred in Russia and that Russian Longhairs (Siberian, Russian Angora) spread from Russia into Turkey (becoming Angoras), Persia (becoming Persians) and surrounding countries and south east Asia (introducing the gene into native cats to create Longhair Japanese Bobtails) by land and sea trade routes, retaining many of their cold-climate adaptations: a heavier body, dense undercoat and coarser hair. If so, all longhairs are derived from the Siberian cat. Yet another view is that long hair arose and was developed in Turkey and transported on land and sea trade routes to Europe, the Middle East and Far East. Much of this is based on the supposed origins of the modern Persian breed which was derived from Turkish Angoras, Russian Longhairs and purported Persian cats. Long fur in domestic cats appears to be an adaptation to cold as the paws do not have long fur underneath; in desert species of wildcat long hair is found on the paws and protects against hot surfaces. It is possible that the longhair mutation has occurred not once, but many times and that it is still occurs. Some genes are mutational hot-spots e.g. identical mutations for curly hair and for bobbed tails have occurred (and still do) independently in differently locations. Parallel evolution means that similar cold environments could lead unrelated cat populations to evolve similar traits through natural selection in a relatively short period of time. Long hair mutations are seen in other cat species e.g. the cheetah has produced semi-longhair "woolly cheetah" variants in the past. Longhairs range from "woolly" usually due to the undercoat) to fine and silky and the length itself varies from the flowing coat of the modern Persian to the semi-long coat of Turkish breeds. Semi-longhaired variants in normally short-haired breeds are generally blamed on recessive genes, but could be due to more recent mutations. The first longhairs recognised by the western cat fancies were Angoras and Persians whose histories are intertwined. The Persian group is defined as all varieties developed from cats imported from Turkey, Persia (now Iran), Afghanistan and Russia at the turn of the 18th and 19th centuries. Brian Vesey-Fitzgerald "Cats" (1958) mentioned the belief, held by some, that a female Black Persian was imported direct from the Shah of Persia himself. 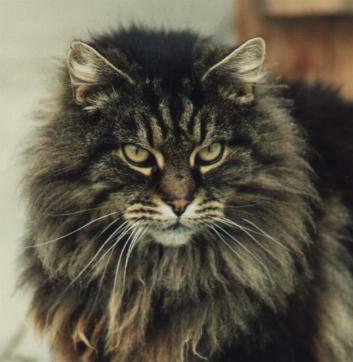 Longhaired cats were first seen in Europe in the 1500s, first in Italy (1521) and then in France. They were named after the Turkish city of Angora (Ankhara). The first documented ancestors of the Persian were imported from Persia into Italy in 1620 by Pietro della Valle, and from Turkey into France by Nicholas-Claude Fabri de Peiresc at around the same time. From France they soon reached Britain. 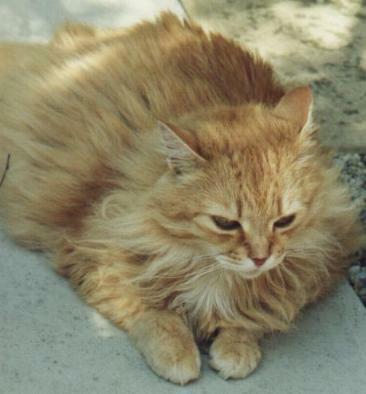 The longhaired cats from Persia were interbred with Turkish Angoras. A tabby Angora cat is depicted in Buffon’s "Natural History" (1756). Its head length and conformation are generally similar to the Turkish Angora except that its ears are set lower on the head. The first longhairs in Britain were variously described as Angoras or as French cats (the latter generally being white). They were also known as Chinese (some longhairs were imported from China where they were known as four-ear cats due to the furnishings of the ear), Russian (the Russian Longhair or Russian Angora was known) and Indian. It was the existence of longhairs in China which led some to speculate that the longhair trait entered the domestic cat population through hybridisation with the Pallas cat. It is suggested that longhairs reached China from Iran (Persia), as a gift of the king of Persia. The eighteenth-century French naturalist the Comte de Buffon quoted the 16th/17th Century Italian traveller Pietro della Valle: ‘In Europe there is a species of cats which properly belong to the province of Chorazan the USSR and Afghanistan. Their beauty consists in the colour of their hair, which is grey, and uniformly the same over the whole body, except that it is darker on the back and head, and clearer on the breast and belly, where it approaches to whiteness. Besides, the hair is fine, shining, soft as silk, and so long, that, though not frizzled, it forms ringlets in some parts, and particularly under the throat. The most beautiful part of the body is the tail, which is very long, and covered with hair five or six inches in length. They extend and turn it upon their back, like the squirrel, the point resembling a plume of feathers. 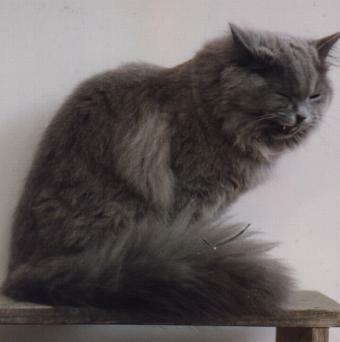 They are very tame; and the Portuguese have brought them from Persia into India.’ From this description it appears, that the Persian cats resemble, in colour, those we call Chartreux cats, and that, except in colour, have a perfect resemblance to the cat of Angora. Buffon had not seen these "Persian" cats himself, but he was familiar with the Angora in France and he apparently believed there was no difference between an Angora and a Persian except in colour (the cat was possibly a black smoke or blue smoke Angora). He named them "Catus Angorensis". An apparently now extinct longhaired cat from China was known as the Sumxu, a fold-eared cat which was reported from the area around Peking, China. 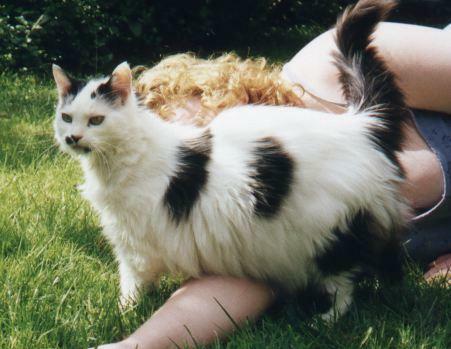 It was a longhaired cat with white fur and pendulous ears. It was described (mostly with regard to its folded ears) several times in the 1700s, with the final report being in 1938; though evidently extinct it indicates the presence of longhairs in China. In the late 18th century, longhair cats with coarser, denser coats, and a stockier build were imported into Britain from Persia, Afghanistan and Russia. Cats imported from Turkey were mostly whites with a short, soft, silky top coat and little undercoat (and no woolliness in the undercoat). Those from Russia, Afghanistan and Persia were mostly black or blue and less foreign in type. The Angora has a ruff, breeches and a plumy tail, but unlike the later Persian, its coat followed the lines of its body due to the absence of woolly "padding" beneath. The Russian Angoras had green rather than blue, eyes. A letter from M Lottin de la Val, President of the Imperial Acclimatation Society, to the President of the French Zoological Society in 1856 stated, "When you recently did me the honour of calling on me, you imparted the recently held view that the so called 'Angora' cat does not exist or could not exist except in the vicinity of ancient Ancyra. I hasten to dispel this illusion. I myself came upon specimens of that lovely feline species in the great Armenian plateau, at Erzerum, where the climate is greatly different from that of Angora. The species is very numerous at Mourch in Kurdistan, where it is the dominant variety. I also found it at Billis and in the pashalik of Bayazit.. The finest specimens, however, which I saw belonged to the Archbishop of Van, a town in the east of Kurdistan, on the frontier of Azerbaidjan. He had three of them, one pearl grey, one orange-hued with black and white flecks, and a third, which was completely white. Their fur was magnificent, though there was thought to be nothing to be surprised at in them, as such cats are common in Kurdistan. I also saw some at the residence of Khan Mahmoud, Prince of Hekiars, at Alpeit. I can not recall having seen any in Persia, though, had I thought that scientists might have been interested, I would have taken care to seek them out, busy as I was. But what will surprise you most of all is that despite the high temperatures prevailing, one should find Angora cats at Baghdad, though certainly these are not so fine as those to be found on the northern slopes of the medique and Taurus mountains, though whether the difference is due to the hot atmosphere or the hostility of the people of Baghdad, I cannot say. You will no doubt settle that point better than I could, all I can say is that the people of Baghdad are in constant warfare with their cats, maintaining, not without good reason, in my opinion, that they bring the plague, because of their fur coats and their habits." While these longhairs might not have been appreciated in their native land, their charms were not lost on British cat fanciers. In "Our Cats" in 1889, Harrison Weir wrote of the various longhaired cats: "There are several varieties - the Russian, the Angora, the Persian, and Indian. Forty or fifty years ago they used to be called French cats, as they were mostly imported from Paris - more particularly the white, which were then very much in fashion." For information on varieties of longhair, see the index below!